← The last word on delayed cord clamping for preterms? Part 1. The last word on delayed cord clamping in the preterm? Part 2. I mentioned the second trial I wanted to discuss at the beginning of part 1. Duley L, et al. Randomised trial of cord clamping and initial stabilisation at very preterm birth. Archives of disease in childhood Fetal and neonatal edition. 2017. This trial compared immediate (<20 seconds) cord clamping to a minimum of 2 minute clamping for babies less than 32 weeks gestation; the delayed clamping group were placed on a firm surface that allowed medical interventions as necessary with the baby still attached to the umbilical cord and placenta. It was initially planned as a feasibility trial, the ability to perform a full trial being the major outcome for the study. The authors extended the enrolment into this pilot trial while they tried to get funding for a larger RCT (unfortunately they were not succesful) so they ended up enrolling 270 babies who were randomized at less than 32 weeks and thought likely to deliver at less than 32 weeks. Two babies in each group actually delivered after 32 weeks, and some randomized babies (n=6) delivered at 36 weeks or later and were not included in the trial. Leaving a substantial sample size, for a pilot trial, of 270. As this was initially a pilot, to prove feasibility of a future larger trial, the planned analysis was changed to compare clinical outcomes between groups when the trial was extended. The main outcomes are said in the article to be “survival and intraventricular hemorrhage (all grades)”. They authors state that these were intended to be the primary outcomes for the future complete RCT, but the published protocol states that the primary outcome was to be ‘survival without neurosensory disability at 2 years of age’. 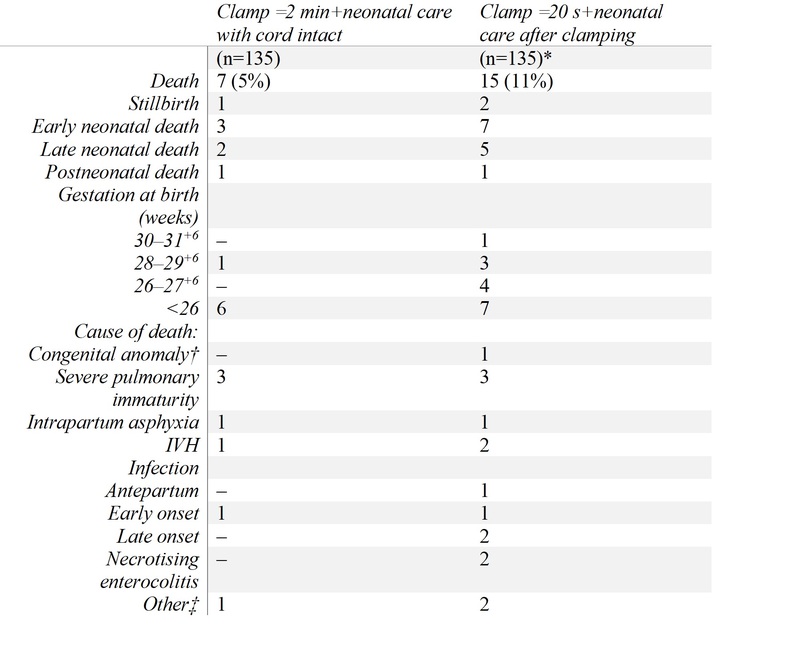 60% of the umbilical cords in the delayed clamping group were indeed clamped at 2 minutes or later, 22% were between 20 seconds and 2 minutes, leaving 18% (about 24 babies) who had early cord clamping in the babies randomized to attempted delayed clamping with stabilization measures with an intact cord. One of the commonest reasons for early clamping in babies randomized to delayed clamping was that the cord was too short, a factor that apparently became less frequent with increasing experience. Almost all of the delayed clamping group were clamped between 2 and 2.5 minutes, but several did go on quite a bit longer, up to 4 minutes, and one brave team clamped the cord of a baby at about 7 minutes. Similar to the APTS trial, there is really no sign of a signal for a significant benefit of delayed clamping for IVH, severe IVH, NEC, treatment for retinopathy or sepsis. There were fewer deaths with delayed clamping, although they had relatively lower power, and the results may have been due to chance, 15/135 died with early clamping, 7/135 died in the group randomized to delayed clamping, Relative Risk 0.47 (95% Confidence Intervals 0.20 to 1.11). As with the APTS trial, causes of death were quite varied, and the gestational ages of the babies who died included some relatively mature babies. Here is table 3 with the mortality figures and causes. There were somewhat fewer babies receiving blood transfusions in the delayed clamping group, 52% with early clamping and 47% with late, no increase in the use of phototherapy, very slightly more NEC (8 cases early clamping, 5 cases late clamping), and slightly less culture positive sepsis (33 cases early clamping, 30 cases late clamping). Severe IVH was practically identical between groups. An interesting trial, congratulations to the team for organizing the ability to do this trial, and for extending the enrolment to achieve a reasonable sample size, as I mentioned before this is the second largest trial of delayed clamping in the preterm. Individually, this trial shows no clear evidence of benefit, and no evidence of harm, a further trial of this approach is warranted, the question now will be what should the control group be for a future trial, given the APTS trial results? Should it be early clamping, or delayed clamping at 60 seconds unless the babies need resuscitation (like the intervention group in APTS)? I think the first thing that is needed is a new systematic review, with meta-analysis where appropriate. So on to part 3! This entry was posted in Neonatal Research and tagged Randomized Controlled Trials, Resuscitation, transfusion. Bookmark the permalink.